See this dog? While I was walking along the shores of Thong Nai Pan Noi, this dog kept on barking at me. I walked along, ignoring him and hoping he won’t come near to take a bite. He didn’t and he eventually stopped. I also stopped as I found a spot on the beach. I spread my sarong and sat down to read my Meg Cabot novel. I was so intent on my book that I only noticed a black presence when it was only inches away from me. It was the dog, sauntering past me, his tail swishing on my face. He walked around me and flopped down beside me. 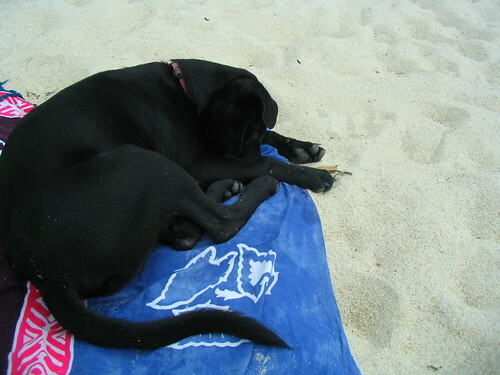 Was he ever comfy, sleeping soundly on my sarong.